Thanks for coming back today for another look-see. If you missed yesterdays post, I am entering a few cards into a challenge that Stampin' Up! is sponsoring @ Leadership, this year in San Antonio, Texas. The challenge is pretty straight forward, and allows any attending demonstrator some creative freedom. 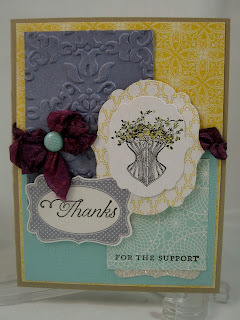 All you need to do is make a card (preferably card front) using a stamp set from the new Occasions catalog. Sounds pretty easy, huh? Well, I posted a card yesterday that I am entering into this challenge, and here are two other cards, using the Rue Des Fleurs stamp set & Attic Boutique DSP. Ok, here is the scoop on these two cards. The first card, I used Attic Boutique DSP paper. For the largest matt, I used the larger print of the pattern paper. I just love the colors, the flowers, and the vintage images. I added a strip of a 'whiter' pattern paper to help show case the yellow, and not take away from the card. I added a scallop trim in the soft suede patter to help ground the brown. I added a piece of pink pleated ribbon to help both hide the seam, and to accentuate the pink. I stamped the umbrella in chocolate chip craft and used clear embossing powder. I 'colored' the umbrella with a pink and a yellow marker. I stamped the sentiments in soft suede classic ink. I sprayed the stamped piece with vanilla smooch. The vellum piece was cut with the petal cone die. Now, for the second card, I used the same pattern paper. But, with a little different twist. I wanted to work with the yellow and blues. So, I selected two of the pattern papers that showcased the yellow. The largest yellow print was used for the largest matt. I added a scrap piece of pool party texture paper at the bottom half of the card. I wanted to use white as an accent. So, I selected the pool party pattern paper. I just love the doily print on this page. I wanted to add purple as an accent color. So, I added the new wisteria wonder card stock piece. I used the vintage wall paper embossing folder to give the paper some depth, and texture. I inked the four frames stamp set in the wisteria wonder classic ink to stamp the 'label', then stamped the 'thanks' in basic black classic ink. I stamped the corset in classic ink, and then used a yellow and wisteria marker to color this image. I added a small piece of silver glitter paper to help give the card some glitz. I hand dyed the vanilla seam binding with elegant eggplant re-inker. The fancy shapes were cut with the new labels collections die. I used an in color designer brad to hold the bow to the card. To give the card a 'finished' look, I sprayed the whole card front with vanilla smooch. Well, thank you for looking. Let me know which of the three cards (todays 2 and yesterdays 1) you like best. The winners will be announced at the end of the week, so I'll keep you posted as to how I did. Sharon, I absolutely LOVE both these cards! You are truly talented and I wish you the best of luck with this Leadership challenge.